How would you like to be a Yeti who ice skates like Scott Hamilton? Story War, a game released on Kickstarter last year, has been the talk of the town. Well at least on the side of town that I live on. The cool side with the gamers and story nerds. Story War was created by Tom McLean and Brad O’Farrell, illustrated by Vondell Swain, and published through Cantrip Games in 2013. Their Kickstarter exploded, and rightfully, raising $363,254 when only asking for $20,000. Needless to say, more add-ons and extra things are in the works, but for now I’m talking about the game currently available, which is Volume 1. 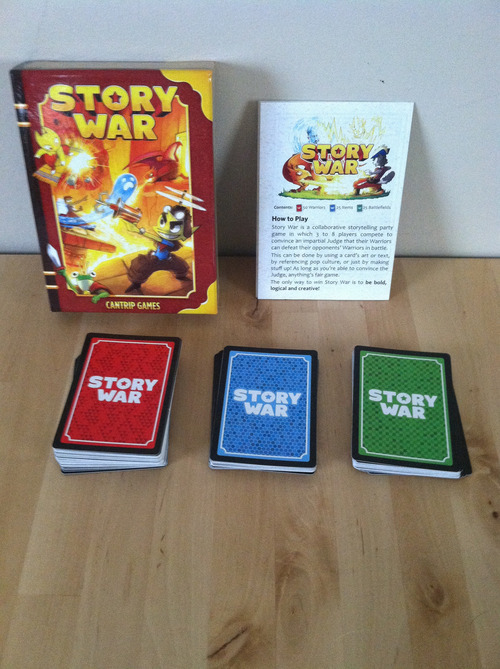 Story War has been compared to the Apples to Apples of storytelling party games. While this is loosely accurate, I believe Story War’s uniquely interpretive style, allows for even more creative game play. Plan on having a group of 3-8 friends/kidnappees/unwilling participants to play, and close to an hour available. Because this game revolves heavily around creating a story, I’m going to recap my memorable experience with Lianne and Gary. If you have 5-8 people, read the variations in the tips section. Each player draws 3 Warrior (red) cards, and 2 Item (blue) cards for their hand. The game owner is the first “judge”. The judge then draws the first Battlefield (green) card, reads it out loud and places it face up for the other players to see. The other 2-3 players must then choose a warrior in his hand to bring into the battlefield, then place them facedown. Then the players flip them over simultaneously. This is when the fun happens. To play, you begin talking. You use your Warrior to defeat the other warrior. Simple as that. I’ll share with you some of the dialogue that happened with Lianne and Gary, and how my role as the judge was used. Gary: I’m an elf, and I appear to have a bow and arrow. I rapidly fire the arrows into the Yeti’s head, causing him harm. Lianne: Well clearly this Crystal Cave has water, and because of the Yeti’s familiarity with the cold elements, turns it to ice. He then skates out of the way of each one like Scott Hamilton. Gary: While the Yeti is practicing his moves, I hoist more arrows onto the bow, finally having an arrow come into contact with the creature. Lianne: BUT! Not before the Yeti quickly runs to you and picks you up like a leaf, and impales you on one of those spiky crystals in the cave. The elf dies! Gary: I am an inch from death, and reach into my pack and drink this *Places the Life Potion on the table from his hands* LIFE POTION. Making me not only as strong and magical as I was before, but gives me the power of two elves! Lianne: Despite this new strength, the Yeti picks up the elf and blasts him through the roof of the Crystal Cave. Gary: I don’t think so! Lianne: YES! I challenge that! Jessica: Clearly the Yeti has some strength, and while the elf is a bit more swift, I think this could happen. So now the elf is above the cave, and is damaged. The Judge acts like the mediator of the story, only chiming in when something needs to be decided upon. As you are battling your opponent, you are allowed to challenge, which forces the judge to take a permanent stance. This part of the game was hilarious, and allows the judge to comply or throw a wrench in the mix. 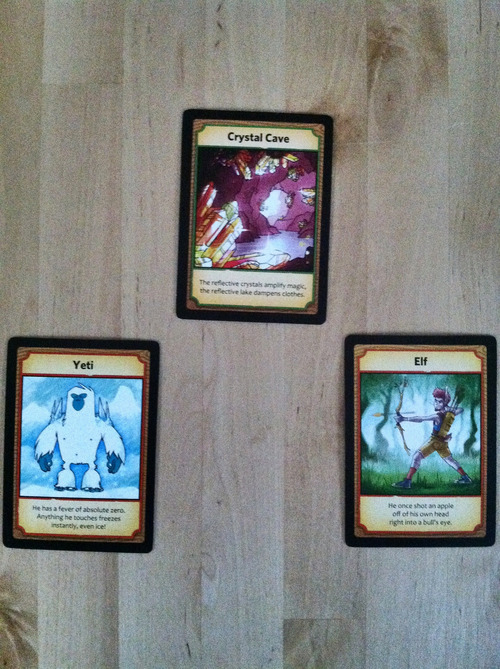 Later in our game, the elf clearly has the advantage and calls his woodland friends to attack the Yeti. To win a round, you must kill the other opponent. When someone is challenging death, each party has a moment to recap and say why the person should die, or defend their character from their fate – and in turn, killing the other. The judge recaps the entire battle, and proclaims the winner. You display your winning warrior card, like in Apples to Apples, and the next round begins. Once a few “rounds” have happened, the stories become more and more imaginative and wild. Giving an opportunity for all players to be a judge gives different opinions and outcomes to what could be a fairly generic game. The best point is that each round is going to be wildly different, inventive, and most importantly, involve everyone who is playing. Endless Possibilities - You can, quite literally, think of anything for your Warrior to do. In fact, the rules state that “anything any player says must be accepted as true unless the judge says otherwise”. So if I want my Yeti to skate like Scott Hamilton, so it shall be. Ease of Use – Gary is not a storyteller. When he got stuck he referred to the artwork and surrounding area to help him. He allowed his strengths to show through, that being his inclination about technical aspects, to form his game play. Meaning, even the least creative of your friends will not be hindered. Extra Cards – The box comes with blank cards of each type, so that you can add your own Warriors, Items, and Battlefield. So far we’ve added Hobbiton, an Invisibility Cloak, and myself. I’m a Warrior! Great for adding the geekdom you and your friends love or know the most about. This game has the breadth for a variety of house rules or variations. Children are encouraged to play the game; the box states it’s good for ages 8+. Some suggestions are having kids figure out who can escape the battleground first, or doing battle in the court of law, figuring out who would be found guilty. Rule Clarification – When starting the game, myself and the gang were a bit confused. I think they need a FAQ section or to show an example game play situation from start to finish. Storyteller Advantage – While this is slight, if the right person or people were allowed to dominate the dialogue, I could see where this might get a tad one sided. Just experiment beforehand to get some minds at ease. Do a practice run through first; this will solve most of the questions without reading the instructions over and over. If you have 5-8 players you are placed on teams instead of acting individually. This means the players on the left of the judge form one team, and the ones on the right form the other. One item per team is allowed, per battle. If you have 6 or 8 people playing, you have an additional role in the group. Teams split as above, but the person opposite has a title called ‘Maverick’. This title allows you to join either team at any time, only winning if your team does. I truly enjoyed this game; more so than I expected. The belief that you have to be a naturally creative soul, is completely thrown out the window (or the cave) in this party game. Things get loud, laughter happens, and you’re left wondering how to connect the dots between your hero and his ultimate win. You’re also left to think about how the other person might respond to a certain element, hence being a great example of how knowing your friends will benefit your story. I’m looking forward to the additional volumes, and waiting to hear what Scott Hamilton thinks of the Yeti’s tricks on the ice. Purchase Story War on Amazon, or print for free.